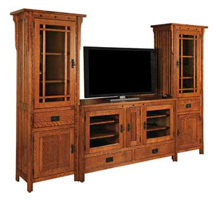 Solid wood Amish entertainment centers add a touch of traditional elegance to your den or living room. Available in oak, cherry and quarter-sawn white oak, these pieces are built using traditional methods to ensure a lifetime of use. We offer a wide range of designs in Mission and Shaker styles to accommodate all your home entertainment devices. When you purchase a solid wood Amish entertainment center from AmishOutletStore.com, you’re not only supporting the local economy, you’re also partaking in a tradition of American craftsmanship that dates back centuries. 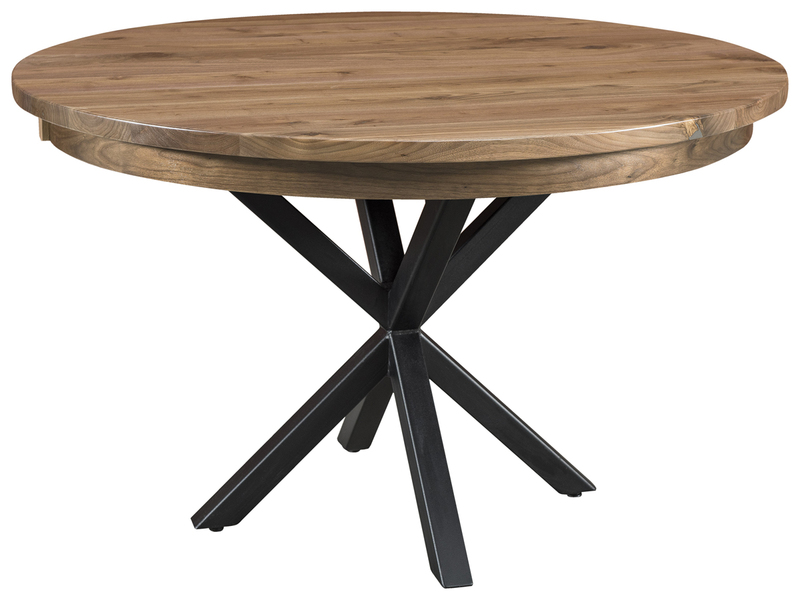 All our furniture is constructed using only solid wood — no particle board or cheap plastics — making them built to last. As in the days of old, our pieces are meant to stay in a family for generations. Entertainment centers from AmishOutletStore.com are available in cherry, oak and quarter-sawn white oak — a traditional, labor-intensive lumber production method that produces a distinctive, rustic-looking grain. Several different stains are available as well, making it easy to match your decor. It’s harder than ever to find products that aren’t built to be disposable or grow obsolete. Our Amish entertainment centers hearken back to a simpler time when owning quality, American-made products was a mark of pride. Discover today how handcrafted furniture can make a difference in your home. What Is the Best Room for My Amish Entertainment Center? Before you purchase one of the beautiful, solid wood entertainment centers you’ll find at AmishOutletStore.com, you may be wondering where in your home you’re going to put it. What is the best room for your Amish entertainment center? The answer, it may not surprise you to learn, is almost any room! Sure, you’ll want one of these solid wood entertainment centers where you plan to do the most entertaining, like a living room or rec room, but these Amish entertainment centers are so versatile, they can go in a bedroom, a basement, a child’s room and just about anywhere you can think of. At AmishOutletStore.com, you’re sure to find an entertainment center that fits your personal needs. 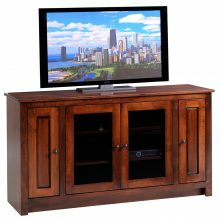 There are solid wood entertainment centers with shelves and bookcases, solid wood wall entertainment centers and corner units available, all made in high-quality hardwood, oak, quarter-sawn white oak or cherry. Whatever your room needs in an entertainment center, you can almost certainly find it here. How Do I Match My Décor with My New Entertainment Center? Matching décor with solid wood Amish entertainment centers is a breeze. 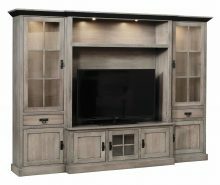 Once you’ve chosen the appropriate entertainment center style for your home, you can customize by choosing your wood and then selecting from one of the many attractive wood stains we have available. This creates a number of combinations that enables you to design a handmade entertainment center that looks great with just about any décor. Are There Matching Furniture Sets I Can Pair With My New Entertainment Center? Absolutely! 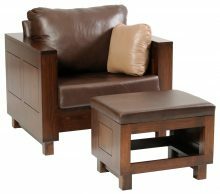 At AmishOutletStore.com, you’ll find just about every piece of furniture you could possibly need for your home. Many of these pieces naturally go together already and will fit in right with your new Amish entertainment center. Remember, though: you can customize with your choice of wood and stain, so you can order a set of furniture with matching or complementary stains to make sure your entire furniture set fits together perfectly with a cohesive look that will delight your family and impress your neighbors. While we don’t expect you to subject your entertainment center to too much stress, these pieces can handle it. These aren’t throw-away particle board cookie-cutter entertainment centers that will fall apart the second you try to move them from one part of the living room to another. These are solid wood entertainment centers built by Amish craftsmen with a centuries-long tradition of quality workmanship. That means these pieces are built to last. With proper care, you could be handing your Amish entertainment center down to your children and even to their children. If you’re looking for that last piece of great furniture to pull your home together, you just may have found it in a beautifully crafted, solidly designed, classic solid wood entertainment center from AmishOutletStore.com. Take a look at the selection and find the Amish entertainment center that’s perfect for you today.